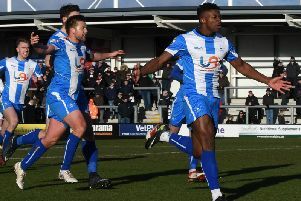 Craig Hignett has admitted his Hartlepool United side lack leaders. Although, that doesn’t necessarily mean the gaffer will turn to club captain Billy Paynter to add experience to his youthful starting XI. Some sections of the Pools faithful have been calling for veteran frontman Paynter to come into the side, especially after last weekend’s depressing 3-2 loss at Barnet. Many want him to slot in along side in-form Irishman Padraig Amond, not replace him, especially at home. While Hignett says Paynter has got a role to play this season, he has stopped short of saying he will turn to the 32-year-old Scouser to lead his struggling Pools side from the front. “We are missing experience at times,” said Hignett. “Billy is skipper and captain and brilliant around the dressing room. I’ve spoke with him this week and he has a massive part to play this season. On the experience issue, Hignett is praying that Rob Jones will declare himself fit to start Sunday’s FA Cup clash with Stamford. The 36-year-old only just missed out on a place in the side at The Hive. And it is in defence that Hignett feels Pools need leadership and experience the most. “We are a young side,” said the manager. “We are forced into doing what we are doing at the moment with experienced players missing in Rob, Batesy (Matthew Bates) and Mags (Carl Magnay). “It’s difficult. The lads are young, there’s no talkers in the back four right now – not a leader, a proper leader like Rob. No-one says ‘you in here, you come here’ and it’s the same all over the pitch. It is not all about the negatives for Hignett, though, especially when it comes to the youth in his team. “On the flip side of the inexperience we have young lads who will move higher and progress in their careers,” he said. “Sometimes it is as simple as having a talker in there telling people where to be. Batesy can manage a game and he won’t just play where the ball is, going chasing it. “He will let others do what they want and react to where the ball is. We did work on it in pre-season in showing people where they are weak and how to do it, but when the game starts players get carried away with the game. “It’s natural for me to work the game and manage it, that’s what I’ve always done, but I understand where we are at. “Technically we aren’t a million miles away from Championship football, but it’s the mentality we have to look to alter.